Hi Friends! 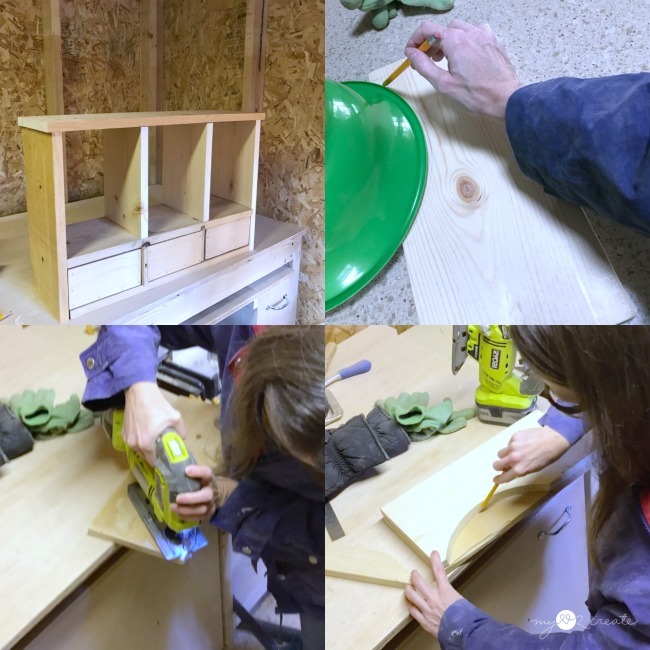 Today I am sharing an easy build, a 3 Drawer Storage Shelf! Isn't it cute?! 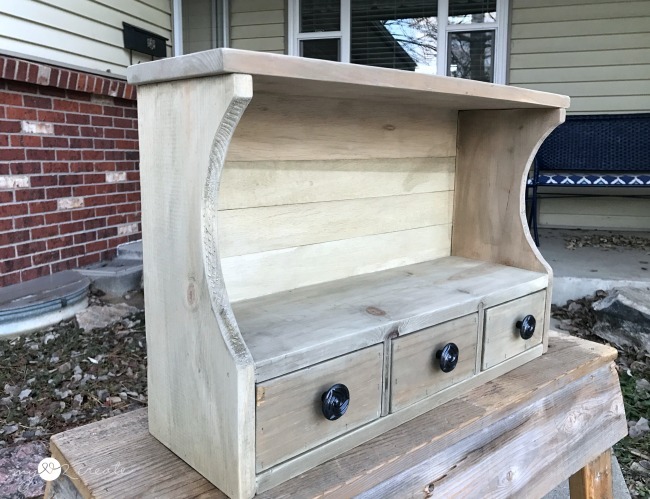 I made it out of some scrap wood and it can be used in so many different ways. 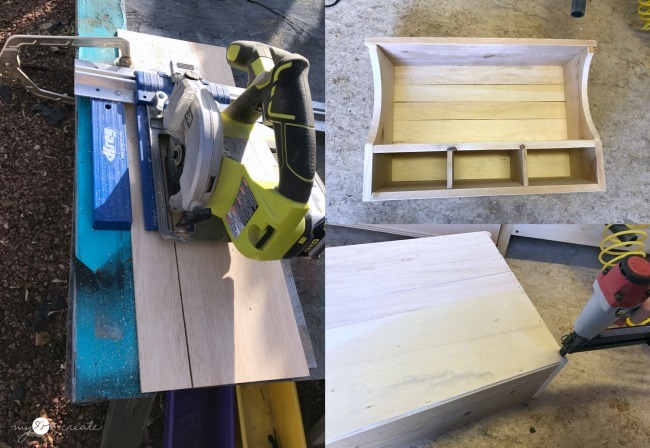 I started with some scrap plywood squares and started figuring out what size to make them into little drawers. 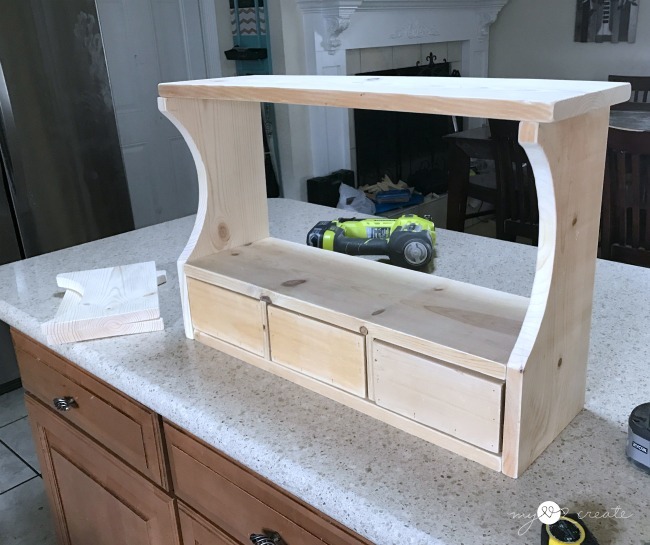 I built the drawers using wood glue and 1 1/4'' finish nails. 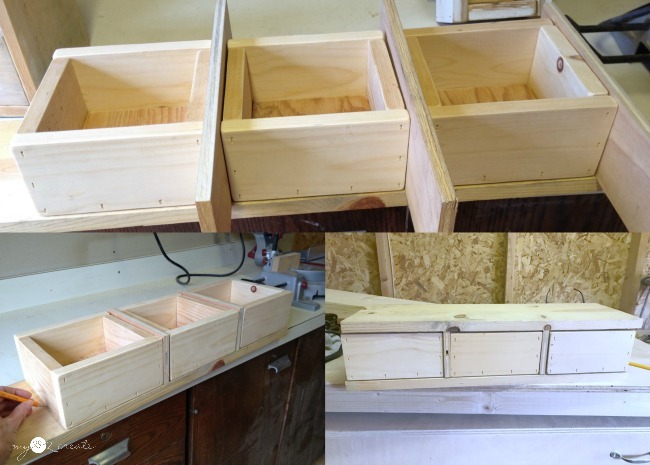 The finished drawers are 7'' wide and 7 1/4'' deep. I grabbed some scrap 1/2'' plywood to use as dividers between the drawers. 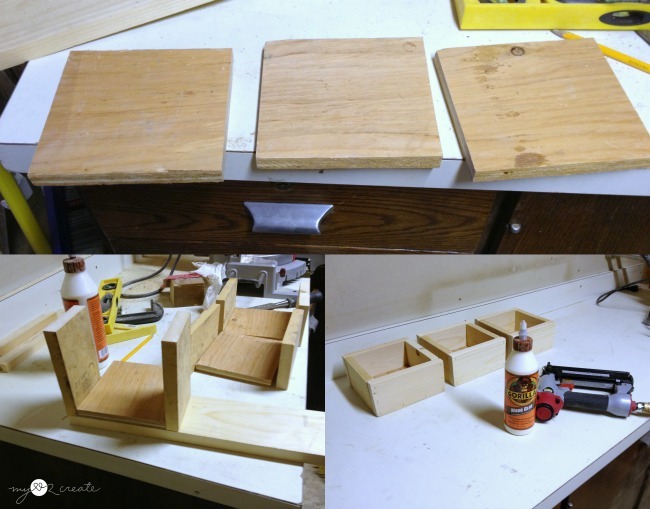 The dividers are 7 1/4'' x 3 3/4'' which makes them 1/4'' taller than the 1x4 drawers so they can easily slide in and out. I also cut the 1x8 bottom and shelf boards @ 22 1/2'' to hold my drawers. Now I have a confession...I made the above about three years ago...I know. I obviously got distracted, and never got back to this project, so I am thrilled to FINALLY finish it! It am actually amazed I had all the pieces together, not to mention the photos! Since I hadn't done the sides yet I grabbed some scrap 1x8 boards and started trying out some options. You can see in the top left photo I had some dividers. 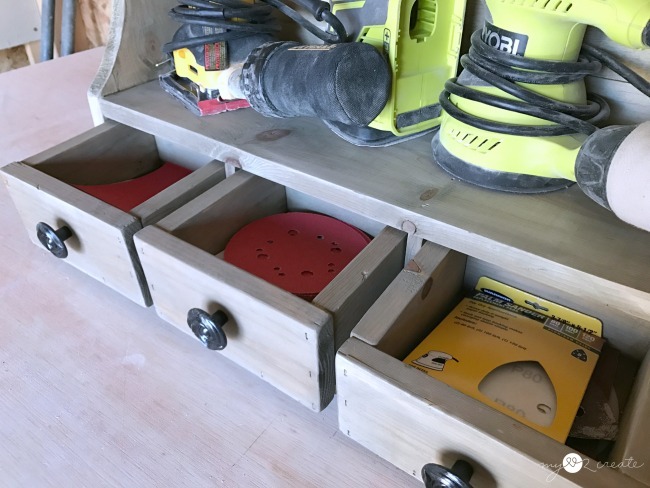 I eventually ruled them out because I am thinking of using this shelf in my shop for holding my sanders and sand paper, and I thought the dividers might get in the way. 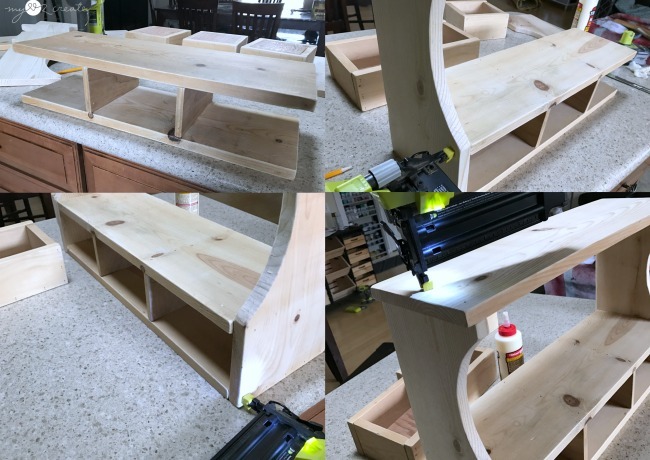 I didn't like the look of the straight sides, so I grabbed a bowl from the kitchen and marked a semi circle, then I cut it out on my Ryobi Jig Saw. I just used my first cut side to mark and cut the second. I did end up cutting out the dividers as well then tried some options with a dry fit. I really liked them, but ended up not using them at the last minute. This is my dry fit without the dividers. I went out to find some scrap 1/4'' plywood for the back and found two pieces that would cover the the back of the shelf. But since you would see the seam, I decided to rip the top piece into smaller strips with my Ryobi Circular Saw and Kreg Rip-Cut, so I had multiple seams. I really like how it make the back look. 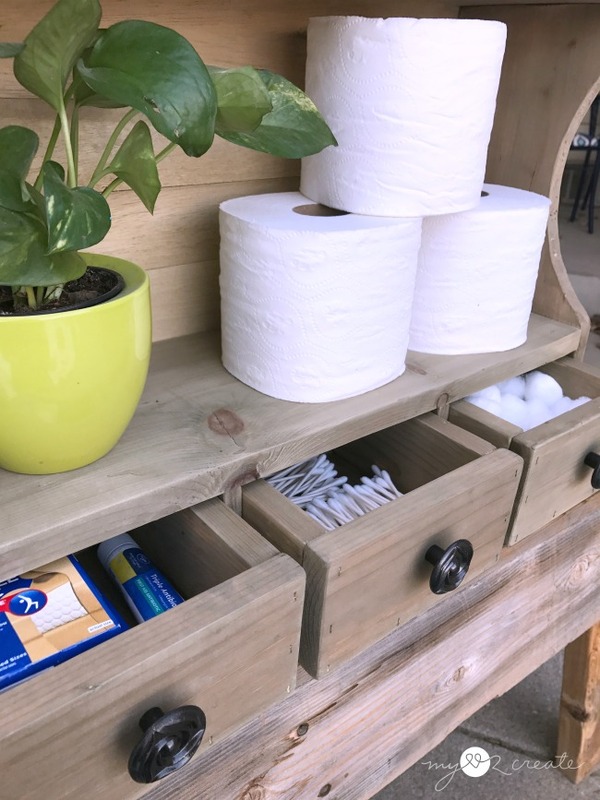 I glued and stapled it on, making sure to staple into all the edges of the plywood strips and into the middle shelf board. Now to finish...this part is always hard for me, because I am so indecisive. Also because if I am going to use it in my shed for my sanders I really didn't think I wanted to do a finish. 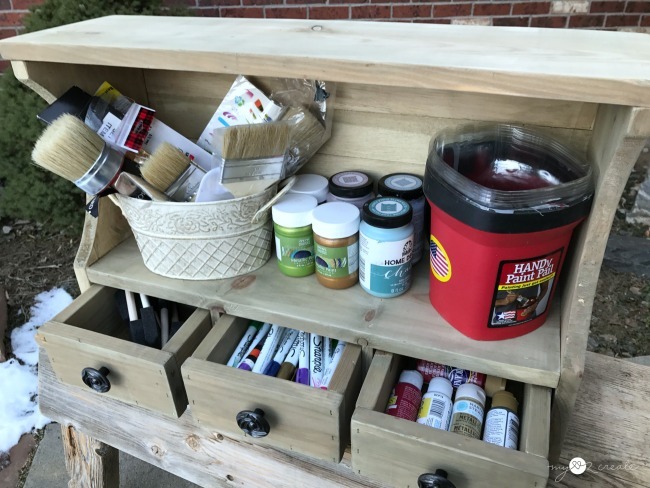 I eventually decided to use my Vintage Wood stain that I used on my Small Bathroom Vanity because it is quick and easy and makes a really cool old wood finish with hardly any work, just in case I end up putting it in a dirty shed. Or if I end up deciding that the shed isn't he best place for it, at least it will have a finish...cause that may happen...you never know! 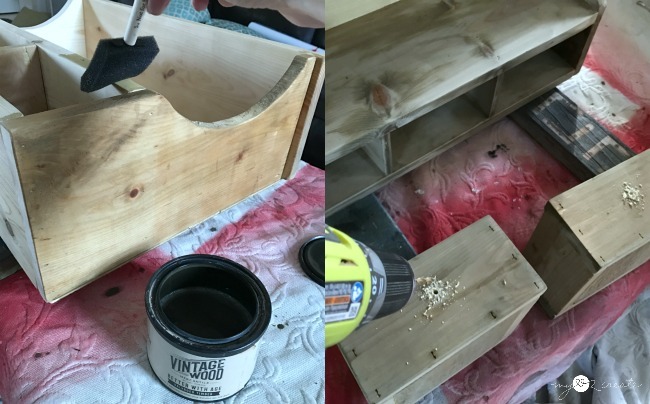 Oh, and I drilled holes into the drawer fronts to add some knobs I had on hand. It would be a perfect addition to a craft room, either hung on the wall or on sitting on a table. Or sandpaper...really the possibilities are endless! If I do end up using it for my sanders, I am glad I didn't add the dividers, my sanders wouldn't have fit. So what do you think is this good for my sanders or is it too cute for the shed? What would you use it for? 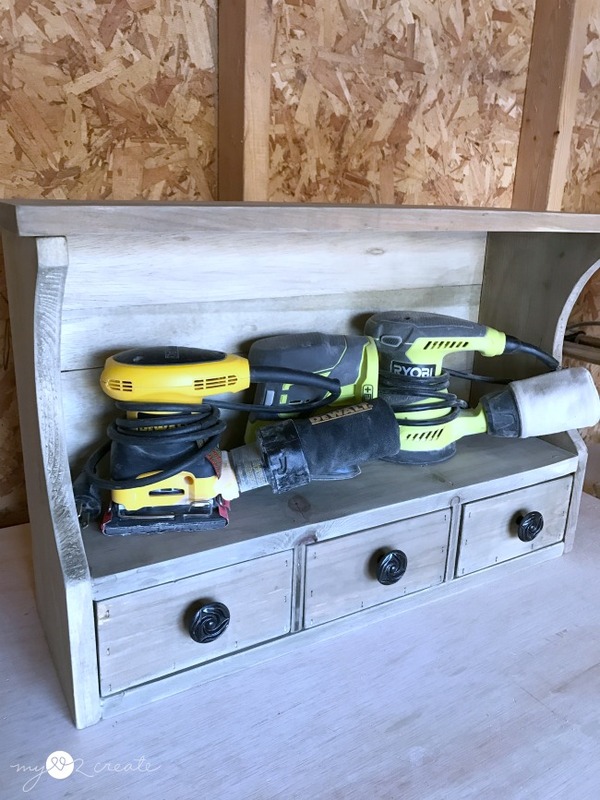 I have been on an organization kick and I am happy to say that if you are too, the Power Tool Challenge Team has some more great organization projects you might want to try! 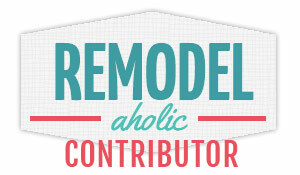 Just click on the links below this image and you can get inspired to get organized! Oh my gosh! I don't know where to begin. First, you could find everything after so long? way to go! Second, LOVE the curve (bowl) genius! and happy you left the dividers out... I am sure I'll see them down the road in another project because you are like me and never throw anything away. Third!!! you overcame the challenge of seeing a seam in the back. brilliant! you rocked this one Mindi! I love this project and am not sure where I'd use it because it's so darned cute and so practical. I think you should use this one in your home and make a second one for your shed. Mindi, I love this! The color is perfect! You did an awesome job and I love the arched details. 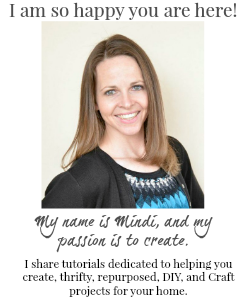 I love how easy this is, Mindi! 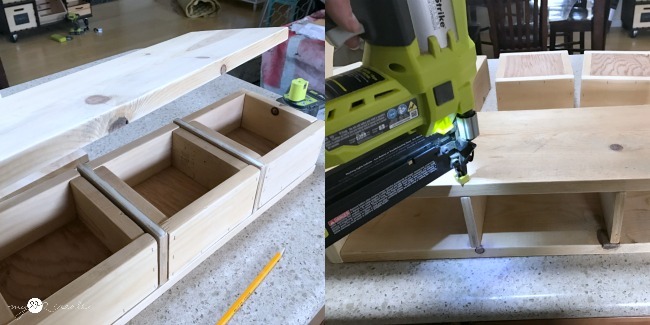 I like the step where you show how you created perfect-fitting drawers. 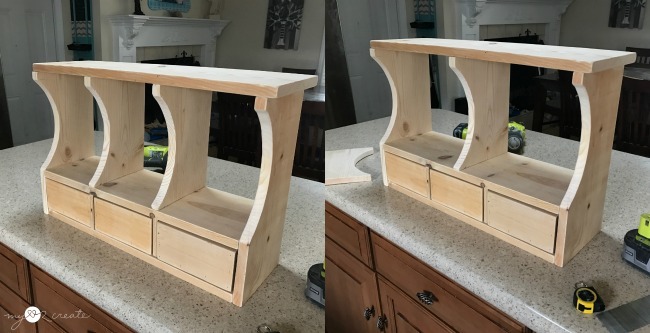 I'm just getting into building more things, and one thing I learned is that drawers are FINICKY. But when you place them like you did, it seems no-brainer. Thanks for that visual! Love this. Pinning! 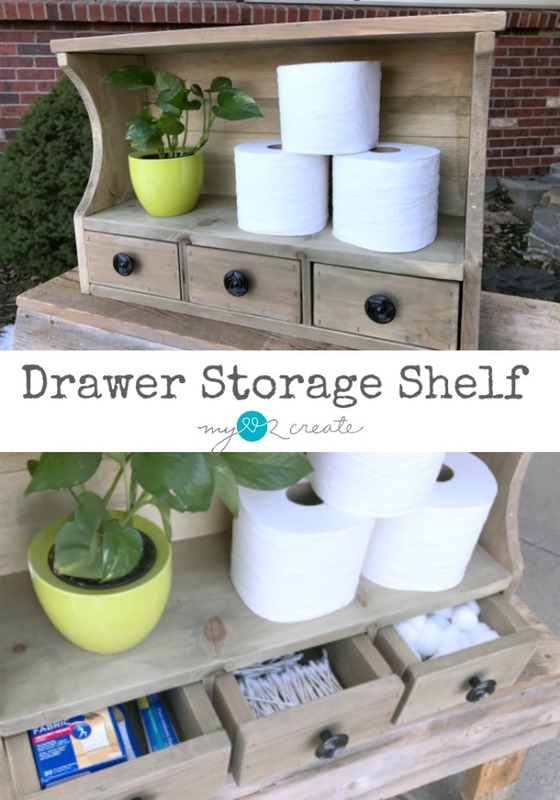 Perfect size to fit in any space... great tutorial! Wow. That looks amazing. You did a great job on it! I love this! And so many different ways you can use it! Pinning and sharing! Mindi that turned out beautiful, well with the wait! You could use that just about in any room. Maybe you need to make a few more?